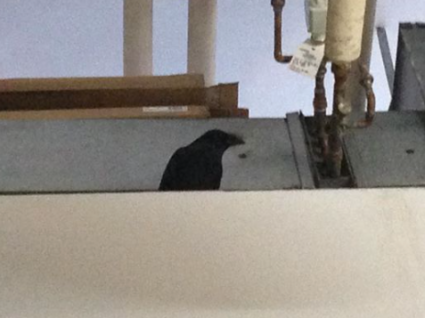 Tuesday afternoon, Nov 8, 2016: “There’s a crow that’s been trapped in the school since yesterday, perched atop the media gallery.” The email was from Matt Stephanson, a technician at Emily Carr University. The US election day was already filled with anxiety, and this message added a sense of urgency. I headed to the school. The crow was perched 15 feet up, in a space between the top of the gallery and the roof of the building. The cramped area was filled with ventilation ducts, pipes and metal boxes. He looked down at me, and all the students walking to their classes. It was the busiest corner in the University. Over the course of minutes, hundreds of people passed beneath him. His mouth was open and he held his wings away from his body. He was thirsty and hot. Matt had provided a bowl of water and peanuts on a ledge below him, but they were too far away for him to comfortably reach. ”… the crow flew right by my window” said Mindy Bains in facilities. He had entered by the front door, flew through the atrium, up the stairs, through the door at the top, and landed on the Gallery. The University had brought in a ‘pest control’ company, and called the SPCA. The former had frightened the crow and failed to do anything constructive. The latter referred them to Wildlife Rescue. I requested the hydraulic lift be used to move the bowl of water and peanuts to the top of the wall where the crow could reach them. Nic Hubines from engineering did this. In a few moments the crow moved towards the water. He drank. He hopped back to his position on the wall and wiped his beak on the corner. He seemed grateful. He was perkier, had a closed mouth, and his wings were properly folded against his body. Some students stopped and admired him; some asked about his welfare. I called Wildlife Rescue and they advised on how to lure the crow out of the building. I sent emails and texts to people on campus who might want to help. Mindy and I discussed the shortest route out of the building. The main door is hundreds of feet away. He needed a closer exit. The large photo studio, only 20 feet away has an opening window. The crow wouldn’t be able to see the window from his perch, but perhaps he could sense the outside air coming through it. We used tarps to block all other hallways. We blocked doors and directed the students away from the area. I placed a light in the photo studio to draw the crow in. Ideally, we would also turn off all other lights, but this was not possible in the situation. I put a bit of food at the entrance to the studio. I pulled up a chair and sat beneath him, looked up and talked to him. This providing a familiar friendly face. Trudy Chalmers from the dean’s office arrived and we discussed the plan. Earlier, she had called the Public Market to ask what they do when birds enter the huge building. “We wait for them to die,” they said. Someone was listening to our conversation, “so be it!” she said. In the evening Alex Phillips, a faculty member, came to help. Alex and Trudy arranged the window wall of the photo studio; placing screens in front of the non-opening glass so the crow wouldn’t fly into them. The screens framed the opened window to clearly indicate it as the only exit. We talked nicely to the crow, flirting with him, and pointed to the photo studio. We played crow calls from bird apps on our phones. He made a short flight over to a pipe outside the studio, but then returned to his perch. He was comfortable and not ready to leave. He cracked peanut shells and ate the nuts. After a few hours, he headed higher up onto the pipes to sleep. At 9:30pm, we decided to go home, hoping he’d make a dash for the studio during the night. I reassured myself that wild animals have wisdom from previous experiences, and that we’d help him figure things out. 7:00am, Wednesday. The first morning of the Trump presidency. Greg and I were quiet as we drove to the University. Our hearts sank further when we saw the crow. He was in the same place on the top of the wall. We made a few more attempts to lure him. We cawed, whistled, and gave him little pep talks. He seemed interested in us but he didn’t budge. I located executive Janice Wong and Nic and we discussed Plan B. 10:45am, we met back at the gallery. Trudy, Nic, Greg and myself were joined by Terry Plummer in technical services and Matt Skinner in audio visual. The plan was to gently but directly guide the crow into the photo studio. We secured the area from any other people. The hall leading to the studio was clear. Nic turned on the hydraulic lift and the crow started agitating. Greg and Nic, both on the lift, used long bamboo poles to make small gestures behind the crow. Matt, Trudy and I each held a long pole pointing into the rafters. These would discourage him from moving onto a new perch. The crow got the message. He flew, circling around the ceiling. He did this with astonishing accuracy between the complex mechanical systems. We held our breaths! He landed on the beam just outside the entrance to the photo studio. We froze. Together we sensed that he knew this was his only option. He headed through the door. BANG! Matt dropped his pole and ran behind the crow, chasing him further into the studio. I followed. Matt quickly closed the partition drapes as the crow perched on a duct inside. The drapes secured the crow in a smaller space by the window. It all happened so fast, we almost couldn’t believe it! We all laughed and shared our excitement. We double checked that that crow was indeed in there. He safely sat on the duct and looked around. He would have to figure out how to leave by the open window. Matt set up a laptop and webcam inside the space so that we could watch the crow but leave him in peace to examine the space. Thirty minutes later, Mark Canning from AV called. He’d been watching the webcam feed. “I thought you’d like to know that the crow just left the building.” I felt a rush of joy! The crow would join his family and friends, and fly with them tonight to the roost in Burnaby. I shared the news with everyone. We were happy and energized. The crow gave us a ray of hope.